Now that you have a significant amount of background information under your belt, it’s time to get your hands dirty with some actual code. This chapter is 100% compatible with OpenGL 3.x level hardware by changing only a few lines of code. Before we get started, make sure that you have the libraries discussed in the preface ready for use in your compiler. The examples in this chapter (or in this entire book for that matter) will not work without them. Moreover, if you are using Windows, set your program to compile as a console/command line program since we will write to the console for debugging and informational purposes, even in this first chapter. An OpenGL context allows us to pass commands to the underlying hardware, so without one your OpenGL program is quite useless. This section will set up the first bit of code that you will need to set up a functioning window; don’t worry if you don’t understand what the code does at this point, we will discuss the code in detail after we have our first program up and running. Even if the end result of the code above is an unspectacular blank window that doesn't seem to do much, there is much going on behind the scenes. Let's step through some of the code that we've just added. We'll walk through the code from the top of the code file to the bottom, leaving and returning to functions where necessary. The WINDOW_TITLE_PREFIX pre-processor definition simply serves as a placeholder for our window title. The reason it's called prefix is because we'll be appending some dynamic text to it a little later on in this chapter. Next up are some global variable definitions CurrentWidth, CurrentHeight of type integer, which store the current dimensions of the window. We also define the global variable WindowHandle, used to store the handle to the window created by FreeGLUT. After declaring the function prototypes and defining the main application entry function, the next function of interest is the InitWindow function, called by the Initialize function. InitWindow calls several FreeGLUT functions to create a window, starting off with glutInit, which initializes the FreeGLUT library. This function does not return anything, but simply sets up FreeGLUT for use in your application. In any program, this should be the first FreeGLUT function you should call. As you may have noticed, glutInit takes two arguments, which are the command line arguments from the main function. FreeGLUT takes several parameters, none of which we shall use in this book, but for demonstrative purposes, we'll simply pass the command line parameters to glutInit. If you don’t wish the user to have any type of control of your program, you should pass empty values to this function. The parameters should be easily decipherable if you’ve read the section on deprecation in the preface; we're asking FreeGLUT to return a forward-compatible OpenGL 4.0 core-profile context. The next function, glutSetOption, is called with the GLUT_ACTION_ON_WINDOW_CLOSE option to make sure that the glutMainLoop function in main returns to the program and doesn't exit the program when it's done. The original GLUT library did not return to the program and after GLUT was done rendering it would end your program. This meant that if you had allocated any memory, there was no way to avoid memory leaks without some nasty hacking into the GLUT library. FreeGLUT effectively ends this behaviour by setting the GLUT_ACTION_ON_WINDOW_CLOSE option to GLUT_ACTION_GLUTMAINLOOP_RETURNS. glutInitWindowSize specifies the initial size of the rendering window, in our case the values stored in the CurrentHeight and CurrentWidth variables, 800 and 600 respectively. GLUT_DEPTH enables the usage of the depth buffer, an important mechanism in 3D computer graphics. The depth buffer (also called Z-buffer) contains the floating point Z-depth information of each pixel rendered to the screen. This mechanism is important in the rendering of new objects for making sure that they don't overlap any objects that are closer to the screen (thus also for determining if the new pixel should overwrite the existing pixel). We'll explore the depth buffer much more in chapter three where we'll start drawing three-dimensional objects. GLUT_DOUBLE is a flag that enables the usage of double-buffering, which is a feature that reduces image flickering. With double buffering, all of the draw commands are executed on an off-screen buffer, which is sent to the screen when all of the drawing for a frame has been completed so that no incomplete images are displayed. The buffer that’s currently displayed is referred to as the front buffer, and the buffer that we're drawing to is called the (you guessed it) back buffer. When all of the draw commands have been completed, these buffers are swapped so that the back buffer becomes the front buffer and vice versa. GLUT_RGBA is a flag that defines the way colours are composited by using individual Red, Green, Blue, and Alpha values. glutInitDisplayMode can take several other options, which we'll explore throughout the book. After the display options have been set, we're finally ready to create our window, and thereby our rendering context. A call to glutCreateWindow will create our context and will return a handle to our newly created window. As you may have noticed, the sole parameter to this function is WINDOW_TITLE_PREFIX, which will set the initial title for the window, in our case the string "Chapter 1." We immediately check the return value when the function returns and make sure that if the value is less than one, the program displays an error message and exits with the proper return value. A FreeGLUT window is not valid if the window-handle's value is less than the number 1, at which point the program should fail or retry to create the window. If the program got past this point, we have a valid context and we’re ready for drawing. But before we do that, we need to tell FreeGLUT the functions used to handle window resizing and rendering the scene, which we'll set with glutReshapeFunction and glutDisplayFunction, respectively. The reshape function is called each time the window is resized, and the display function is called each time the scene is to be drawn to the screen. The call back functions for this are defined below in detail in the Resizing and Rendering sections. 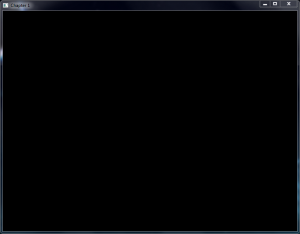 InitWindow is finished at this point and returns to the Initialize function. Since we have an OpenGL context at this point, it's safe to call OpenGL functions, and the first one we call is glGetString with GL_VERSION as its parameter in order to retrieve the version of the OpenGL context created in the InitWindow function. This string is passed to the command line with the standard C function fprintf, which should display similar to the screen below. If the command line does not display OpenGL 4.0, something went wrong with your context creation or your driver did not honour your request for an OpenGL 4.0 context. 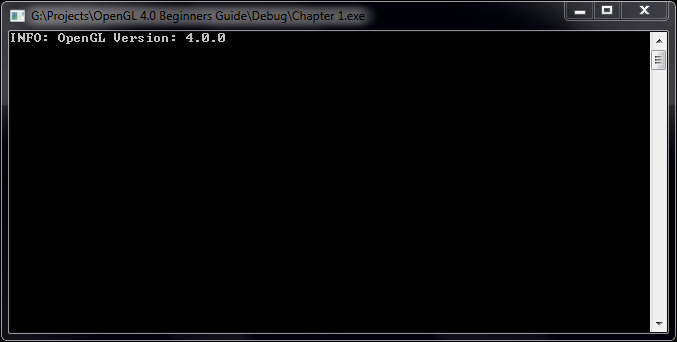 We'll use the command line throughout the book to display debug and general information like this. The last function that we'll call in the Initialize function is glClearColor with its four parameters set to 0.0f, representing (in order) the Red, Green, Blue, and Alpha color channels, this corresponds to the FreeGLUT flag GLUT_RGBA that we used with the glutInitDisplayMode function. The values provided to glClearColor must be on a scale from 0.0f to 1.0f, corresponding to 0% - 100% color channel intensity. In the RGB color space, when all of the color channels are at 100% intensity, the resulting color is white. This also means that the opposite is true: when all of the color channels are at 0% intensity, the resulting color is black. The last value, the alpha channel, determines the amount of transparency, but since we don't use transparency in this chapter, setting this value is meaningless for the moment. At this point, we're done initializing and the Initialize function returns to the main function where the program will call glutMainLoop, the heart of the application. This function will run as long as the window is active and the window hasn't been closed, issuing draw commands and handling window operations. When the window closes, glutMainLoop terminates, and the main function returns the standard return value of EXIT_SUCCESS. There are two functions left that haven't been discussed in the previous section, the first of which is called ResizeFunction, which handles the window resize event. Each time the window is resized a new window size is defined and passed to the application. We capture these new values in ResizeFunction and store the values in CurrentWidth and CurrentHeight. While this is all quite straightforward, the function call that stands out the most is glViewport, something we haven't seen up to this point. 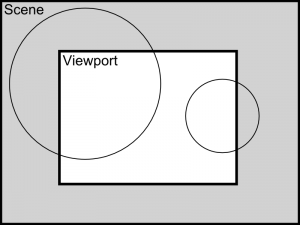 A viewport defines the area drawn to by OpenGL; any point that falls outside of the viewport is not drawn. The reason this is called a viewport is because it is a window into the scene, looking over only a small area of a possibly much larger scene. It is important to notify OpenGL about any changes in the viewport so that we don't draw any pixels outside of the screen, resulting in wasted calculations that would be better spent elsewhere. The X and Y coordinates correspond to the left lower bottom corner of the viewport, in our case the left lower bottom corner of our window (0, 0). This function also allows you to draw to a very specific area on the containing window, smaller than the actual window itself. For example, this could prove useful if you need to incorporate OpenGL graphics into a user interface. The final function we'll discuss in this section is RenderFunction, where the drawing (rendering) of objects and the swapping of the back and front buffers occur. The first function call that we encounter in RenderFunction is glClear, an OpenGL function call which cleans certain buffers specified through its parameters. What this means is that before we reuse the buffer, all of the pixels in it are set to a certain value. For example, the back buffer is cleared with the RGB colour value specified through glClearColor earlier in the Initialize function. The back buffer is cleared by passing GL_COLOR_BUFFER_BIT to glClear. Besides the back buffer, we also clear the depth buffer by passing the GL_DEPTH_BUFFER_BIT flag into glClear. After clearing the buffers, we're free to draw whatever we like onto the screen. However, in this example we don't actually draw anything but an empty screen. This will change in subsequent chapters where we will actually start drawing objects, and all of this drawing will happen after the glClearColor line in RenderFunction. Throughout the text you will encounter the words "drawing" and "rendering," in our case they both mean the same thing: displaying something onto the screen. The next function that we encounter is glutSwapBuffers, which flips the front and back buffers. At this line, your changes will be displayed to the screen and any new drawing will occur on what was previously the front buffer. Now that we have an OpenGL 4.0 context, we'll need the tools to work with it, and by that I mean the OpenGL 4.0 function calls that most likely don't come standard with your system. With only a single function call, we have access to all of the functionality that OpenGL 4.0 provides. We already had the pre-processor include directive #include <GL/glew.h> to get access to all of GLEW’s function calls. If you browse through the glew.h file, you may notice that it replaces the normally used gl.h file. This is why we won't explicitly use the gl.h file provided by your compiler until a future chapter where we will set up a rendering context from scratch. Next, we initialize GLEW in the Initialize function. If you look at the order in which the functions are executed, you'll notice that the OpenGL context is created in InitWindow before GLEW is initialized with a call to glewInit. This happens because GLEW needs to probe the OpenGL implementation for the function calls that it includes, which means that an active context is required. After the call to glewInit, we compare if the return value from glewInit equals GLEW_OK, if it does not, we write an error message to the command line and exit the program. The error message will contain the actual error returned by GLEW through the glewGetErrorString function call. Visually, your program hasn't changed, so when you run it, the screen should look exactly the same as the resulting screen from the previous section. An important factor in most 3D computer graphics is performance and measuring how well your program performs. By performance we mean the amount of data that your program can process during a certain amount of time. Performance in real-time 3D graphics is commonly measured with the amount of renderings a program can complete in the duration of one second; this measurement is called FPS (Frames per Second). In this section, we'll add a simple FPS counter to our program. The first change that we made was adding a new global variable called FrameCount. This variable will hold the count of the amount of frames that we will render in a certain amount of time. The value contained in FrameCount is incremented each time the RenderFunction function is called. Next, we declared two new functions, IdleFunction and TimerFunction, which we notified to FreeGLUT to have a certain meaning in InitWindow. The IdleFunction function definition is only a single line which causes FreeGLUT to redraw as soon as possible. IdleFunction is only run when the program has no more work to do, a state we wish to avoid if our goal is performance. The first time that glutTimerFunc is called, the amount of milliseconds is set to zero, causing the function to be called immediately, in our case this function is TimerFunction. The first line in TimerFunction checks if the value is not equal to zero, if the value would be zero, we'd know that this would be the first time the function is run and to skip the following block of code. In this case, the code would simply reset the value of FrameCount and register another call to TimerFunction in 250 milliseconds -- a quarter of a second. The title of the window is changed by passing a simple character string to the glutSetWindowTitle function. 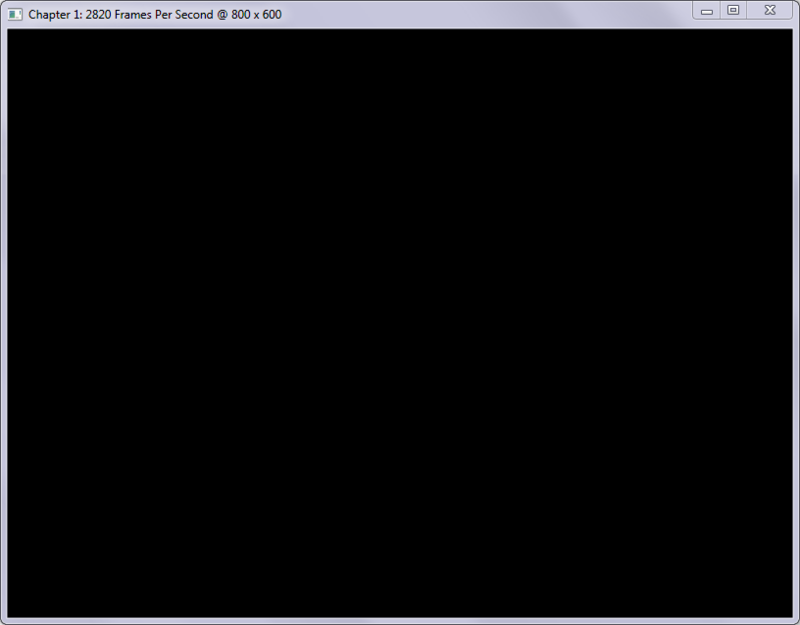 The frames per second are calculated by multiplying the value contained in FrameCount by four since we execute this function every ¼ of a second. The width and height are obtained by reading the value from the CurrentWidth and CurrentHeight global variables. If you wish to update the title more often, you can set the glutTimerFunction in the TimerFunction function to update more often. For instance, if you wish to update the title eight times per second instead, change the millisecond value to 125 and multiply the FrameCount by eight instead of four. If you run your program and notice that the frames per second displayed don't change, your program may automatically be bound to Vertical Sync (or V-Sync). This value should be equal to the refresh rate of your monitor and is a feature added by your display driver. Vertical Sync is another method for eliminating flickering by waiting for the screen to finish drawing the current frame to the screen before submitting the next one. As mentioned, sometimes your driver will turn on V-Sync by default for some programs. This incurs no difference in quality to the output of your program since the frames processed per second is pegged to the maximum amount of frames that your display device can process. This means that if your monitor runs at 60 Hz (refreshes the picture 60 times per second), a framerate of 100 frames per second means that 40 frames are never displayed and is therefore meaningless. If you so desire, you can turn Vertical Sync off in your display driver’s control panel under the 3D Settings (or similar) heading to get a reading of the potential frames per second processed by your program. However, I do not recommend doing this since it will not enhance the performance of your program in any way whatsoever. Frames per Second, more commonly referred to as FPS is the amount of frames that were rendered by a program during the timespan of a second. This is a metric with limited use in determining the rendering frequency of a program. There is, however, another metric that may provide more useful in a production software where performance is critical, and this is milliseconds per frame. OpenGL provides functionality to retrieve the time it took for the hardware to render a frame through performance queries, which you can read about here. If you don't understand each function call yet, don't worry since you don't have to memorize them all. As long as you have a decent understanding of the mechanics that operate the program, you should be okay until we get to the nitty-gritty stuff. Now that we have a valid rendering context and our window is good to go, in the next chapter we'll start drawing some actual geometry to the screen and explore vertices and polygons. You can find the source code for the samples in this chapter here.